Greetings of the seasons from all the garden fairies here at May Dreams Gardens. You would not believe what has been going on around here. Or rather, you would not believe what has gotten into Carol. We call it the Helleborus Hysterics. When she saw that Helleborus niger 'Josef Lemper' blooming in her garden outside in December she went off on a tear to find out more about these plants and to buy some potted, blooming Helleborus for Christmas. We are garden fairies so we were very happy about this because the more blooms the better as far as we are concerned. Well, let us tell you that it took Carol quite a while to find some hellebores in bloom in pots and get two of them but somehow she managed to do so, but not without a lot of help. Before she found some, you should have seen her going into different grocery stores and florist's shops. "Do you have any Helleborus in bloom", she would ask. We were shocked to hear that some of them did not even know about this flower. One person even asked if she meant Amaryllis. To Carol's credit she answered with a simple no, and did not scold them about the Amaryllis not even being in the same plant family as hellebores, roll her eyes, and go all haughticulturist on them. 'Tis the season, we guess. Anyway, finally, the Hoosier Gardener found some Helleborus niger in bloom in pots at a Trader Joe's store on the other side of the city. She had to go there to get more butter because apparently Christmas is one of those holidays that require lots of butter and she had run out. Carol, of course, would know this if she baked goodies at Christmas time for us garden fairies, but she doesn't so we garden fairies are pretty much on our own when it comes to finding cookies and stuff and pretty much rely on the toast fairies to find what we do find. We are garden fairies, though, and we don't eat a lot of butter. We prefer... oops sorry about that. We are garden fairies and we sometimes get off track. 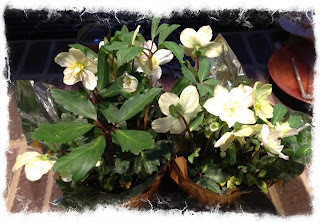 Anyway, the Hoosier Gardener went to Trader Joe's and sent Carol a picture of the hellebores they had. 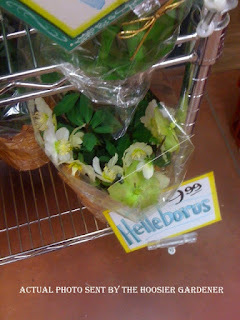 Then she texted Carol the information on the exact location of the hellebores in the store. Then Carol asked a co-worker if he could stop at Trader Joe's on his way home because he lived way up there and he said he would pass right by it, buy two hellebores and bring them to her at work the next day. Then she sent him the picture and the instructions, gave him some money and hoped for the best. Well, the best arrived the next morning at work. Two lovely, lovely Helleborus niger all a-bloom. We have never seen Carol quite so excited about a flower. Well, yes we have. We are garden fairies and we live here so we are used to her getting all excited about a particular flower or plant, and then going down various rabbit holes to find out more about them. We are a bit shocked, of course, that it took her so long to discover this flower. We are not sure what kept her from planting it before. But now that she knows about it and has it in her garden and in two pots inside, she has gone off the deep end, again. 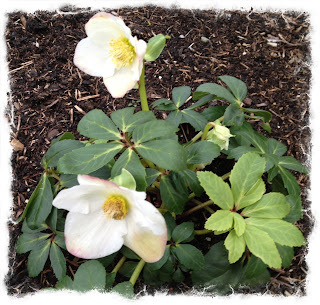 She bought Helleborus: A Comprehensive Guide by C. Colston Burrell and Judith Knott Tyler. While reading it she found some reference to a little book, The Christmas Rose by Arthur and Mildred Luedy, published in 1948, so she bought a used copy of that online and is now on its way to her house, but it is not on Santa's sleigh so it will probably not get here until after the holidays. Did we mention that because Helleborus niger often blooms outside in December some people call it the Christmas Rose? It's blooming outside in Carol's garden right now, on Christmas Eve. But calling it a "rose" is confusing to all but other gardeners who speak Hortish, so Carol keeps calling it a hellebore or Helleborus to avoid confusing non-gardeners because it is not the kind of rose they think of when someone says "rose". Anyway, like we said, Carol has a bad case of Helleborus Hysterics. We are garden fairies, we are used to this happening around here. Let us count the other ailments... Daylily Delirum, Miniature Mania, Vegetable Vapors, Hoe Fever, Columbine Croup... it is an endless list. Now we'll just watch and wait and see how many other hellebores Carol gets before it is all said and done because there is no cure for Helleborus Hysterics. You just have to let it run its course. In the meantime, we are garden fairies, it is Christmas Eve, and there are hellebores in the house so we are going to do the Helleborus Hop. This is a special seasonal dance we do when Helleborus niger is in bloom. And no one dances it better than Thorn Goblinfly. No, there will not be a video published online of us doing the Helleborus Hop... we are garden fairies. So glad the Hoosier Gardener was able to help. Best wishes to you and all the readers of May Dreams Gardens. Merry Christmas to all in your house and garden! Glad to see those garden fairies are keeping on top of things! Merry Christmas and the best for a Happy New Year! I am admiring her restraint at buying just two. Really, can one have too many hellebores. Merry Christmas to you Garden Fairies and to Carol as well. Oh, and I love that book by Cole Burrell. I have it. Good friends are a treasure, and Carol certainly has one in Hoosier Gardener. Helleborus Hysterics (which I call Helleboremania) is an overwwhelming affliction. Fortunately, it's usually manageable with with application of a few plants. "Lo, how a rose ere blooming...." Merry Christmas! I wish I could grow H niger, but it doesn't like my acid soil. It likes a sweet soil. I have to make do with other Hellebore species and hybrids. I hope the H. niger seeds itself around for you the way the H. orientalis does. Wouldn't that be lovely. Dear Thorn and all, we are so glad to hear of the holiday dance for the Helleborus, and so glad more were added to the May Dreams menagerie a dream come true. Merry Christmas to you! To Hallerlake, I have acid soil and this is the second December that H. niger is blooming for me--the same one that Carol has outside. The soil is acid clay, heavily amended with organic matter. Maybe you should try again! I also love the Hellebore, but it won't bloom for me until springtime. Doesn't matter, they still make me happy. Kathy, maybe I will try again. There are some very tempting H. niger to try. Helleborus Hopping is a terrific activity in very early Spring, here. This is when they begin to bloom and it's a very happy hopping time indeed!! You have enjoyed a wonderful day - cute post! Merry Christmas Carol! Sounds like a hopping good time at Carol's house this weekend! Hellebore Hysteria can be contagious, I've heard, so I hope all is well there. Please wish Carol a belated very Merry Christmas for me!